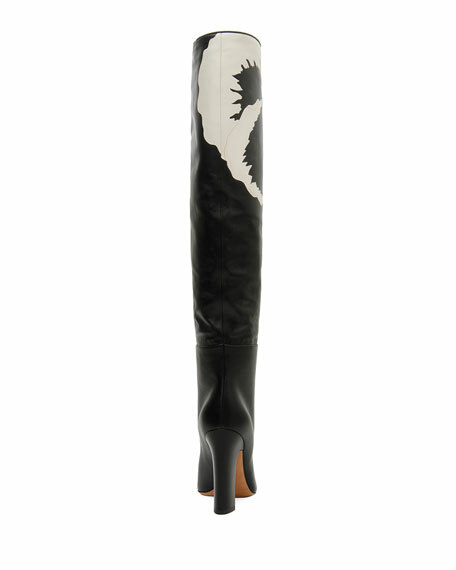 Valentino Garavani smooth calf leather knee-high boots with printed pansy flower. Fit note: Valentino Garavani shoes run small. Please order a 1/2 size larger than you typically wear. Balenciaga knee boot in Prince of Wales plaid suiting fabric. 4.3" stacked block heel. Round toe. Side zip eases dress. Balenciaga knee boot in Prince of Wales plaid suiting fabric. 4.3" stacked block heel. Round toe. Side zip eases dress. Padded footbed. Smooth outsole. Cole Haan "Tali" ballerina flats, updated with logo-plaque bow detail. Grand.OS® technology for lightweight comfort, flexibility, and responsive cushioning. Elastic collar for scrunched fit. Round toe. Quilted footbed. Genevieve weave rubber outsole. Leather lining. Slip-on style. Imported. Sesto Meucci "Zelima" knee boots, an iconic equestrian design in woven leather. 1.3" stacked flat heel. Shaft, approx. 15.5"H. Hidden interior stretch goring for comfort. Side zip for ease of dress. Round toe. Leather lining. Rubber sole. Imported.